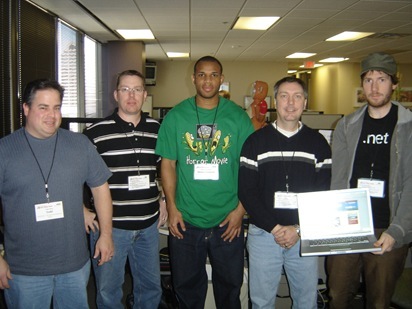 I am still recovering from the intense weekend at the We Are Microsoft Charity Challenge Weekend that took place in Dallas, TX. Toi Wright and the crew put together an awesome event. The event had over 100 developers come together to create solutions for 22 charities in the Dallas, TX area over the weekend. 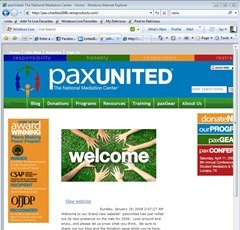 I was assigned to a team of awesome individuals to create a new website for paxUnited. 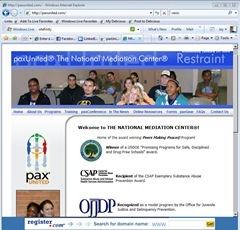 paxUnited provides programs to youth and adults to provide them with the skills they need to peacefully resolve conflicts. paxUnited wanted a complete website that provides a more professional, polished look to customers and clients. Additionally, we would like to establish additional sections for visitors that provide more in-depth information. Another great need is the ability to put merchandise online for purchase and to provide online registration for training courses. Friday evening we meet with two member of paxUnited and quickly got down to discussing requirements, we needed an easy to use content management system that would also included a robust event management system with pre and post test for course registration, a store where you could purchase paxUnited items, and a donation page. We quickly discovered that the current hosting plan that paxUnited had would not support any Microsoft .NET or SQL Server applications so we opted to go with the free hosting offered all of the charities by Verio. After checking out Telerick’s SiteFinity and Telligent’s Graffiti CMS, both very powerful and capable Content Management Systems, we elected to go with mojoPortal. The mojoPortal offered easy to use page editing and included Blog, ecommerce, secure file sharing, surveys, polls and more. Todd had worked with it before and after looking at the demo site that showed off two premium modules we were hooked. Todd contacted the developer directly too see if he would donate the two premium modules to our charity. He agreed, so a huge thanks to mojoPortal for making our project a success. The rest of the weekend we spent creating content and configuring the site. Most of Sunday was spent on the new look and feel of the site. I really want to thank the web designers that help us. The site wouldn’t look nearly as awesome without their help. It was an incredible experience and I want to thank everyone on my team, it was great to get to know you and work with you. This is my second time to attend this event and I hope sometime this year we can have one in Northwest Arkansas. Here are some links to find out more about the event. The facebook group for the event includes lots of photo and several video profiles of the charities. 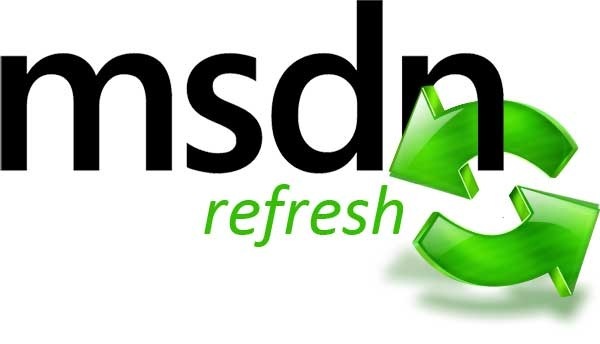 Zain Nebulsi, Microsoft Developer Evangelist for the South Central District is hitting the road in Arkansas with the new MSDN Refresh event series. You may remember last year we had a series of events called MSDN Express, well this is the next version of it. Zain was able to take the concept we pioneered here in Northwest Arkansas and take it to the next level. MSDN Refresh events will be held all over the Microsoft South Central District this year. This is a unique opportunity to get big event content in your local area, so be sure to sign up and attend. In these tough economic times this is free training for your staff. I highly recommend that you plan to attend one of these special events in your area. It was very difficult to get these events in out area and we need to keep them. If we can continue to get a good attendance at smaller events like this we may be able to attract the larger MSDN events to the area. I will be attending the one for Nwa SQL, I hope to see you there. SQL Server 2008 adds numerous new capabilities for developers – from support for Spatial Data types to a storage mechanism for SQL BLOB data using the NTFS file system, and much, much more. The new release also delivers several improvements to development-related areas, from T-SQL to SQLCLR to XML. This presentation will provide a technical dive into the latest and greatest features you’ll find in SQL Server 2008, while offering insight into how to effectively apply them to your upcoming development projects. In this presentation, we’ll focus on the power and productivity of Visual Studio Tools for the Microsoft Office System (VSTO) – a .NET Smart Client technology. We’ll give you tips and tricks for designing and building smart client applications with VSTO, which allows you to create managed code applications with .NET languages including Microsoft Visual Basic .NET and Visual C#. VSTO also makes it simple to manifest the functionality of those applications in the rich user interfaces of Microsoft Office Excel, Word, PowerPoint, Visio, Outlook and others from the Office stack. VSTO addresses some of the biggest challenges that Office solution developers are facing today, including separation of data and view elements, server-side and offline scenarios, seamless integration with the Visual Studio tools, deployment and updating. Join us for this eye-opening session and learn just how easy it is to build and deploy powerful applications with VSTO. Silverlight provides a powerful platform for building the next generation of rich interactive applications on the Internet. In this session, we’ll take a look at the programming model and tools that developers and designers can leverage to build these true next generation experiences for consumers and business, and demonstrate how to build a rich interactive application (RIA) using Silverlight and Microsoft .NET. We’ll explore how to use Microsoft Visual Studio to create applications, and how to create UI using XAML markup and code, controls, and File I/O. We’ll also discuss networking, how to retrieve data from a Web service, and various other aspects of building Silverlight applications. Introducing Microsoft SQL Server 2008 Free Book! 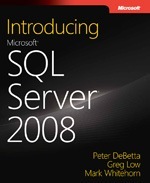 Microsoft Press is offering a free download of the entire e-book Introducing Microsoft SQL Server 2008 by Peter DeBetta and Mark Whitehorn.